We went to see that tonight. It was fantastic. I can say that because I have never read the books and therefore had no expectations. I'm pretty sure I'm going to buy the soundtrack. 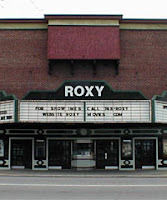 I love going to the Roxy theatre here in The Haven. It costs five dollars to get in. You can get a container of popcorn for as little as $1.00 and candy is just as much (or little). You can't beat that. They even use old school tickets, like the ones you get at the fair. The seats are comfy and the murals on the wall give it so much character. Maybe I should be an advertiser for them. Mostly I think it's wonderful that it is family owned and totally authentic. I have a serious toothache and will probably end up calling the dentist on Monday. They are so good about getting me in for my teeth emergencies. This has happened probably 3 times since living here. I bet if I stopped eating taffy and Now and Laters, I would probably not have this problem. Don't worry, I brush. I think it's a curse that comes with my bad candy eating habits. It's now almost 2 in the morning. Tomorrow is going to come quicker than I would like. Bed is calling my name.